Rep. Ana Hernandez-Luna, Rep. John Davis, Sen. Sylvia Garcia, Rep. Ed Thompson, Sen. Larry Taylor, Rep. Mary Ann Perez, Rep. Harold Dutton Jr., Chad Burke (President & CEO Economic Alliance Houston Port Region). 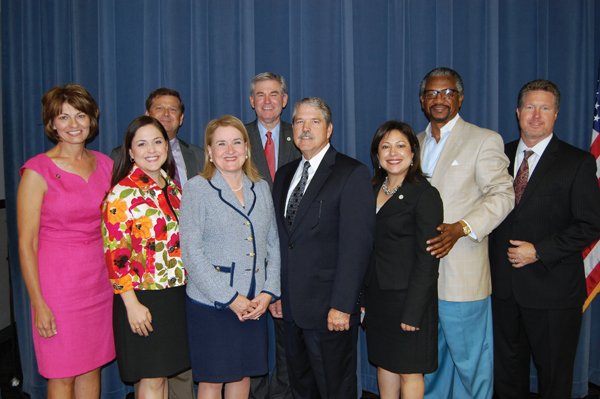 On August 28, state senators, Sylvia Garcia and Larry Taylor, along with six state representatives: Ed Thompson, Wayne Smith, John Davis, Harold Dutton Jr., Ana Hernandez-Luna, and Mary Ann Perez, took to the stage at the San Jacinto Community College North Campus for the Economic Alliance Legislative Wrap-up. Nearly 150 attendees from industry, educational institutions, government entities, and non-profits enjoyed a light repast provided by the San Jacinto Culinary Arts program as the state legislators shared highlights, victories, and shared ongoing concerns from the 83rd Legislative session.